This emotive new LP is not just another Dinosaur Jr. record. 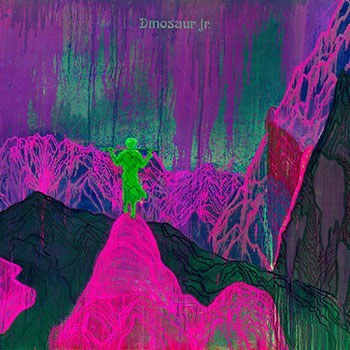 With Give a Glimpse of What Yet Not, the original Dinosaur Jr. line-up has now made more records since reforming and releasing Beyond in 2007 than they did in their initial run. But this feat by J Mascis, Lou Barlow, and Murph, while a good promotional line for the new record isn't all that interesting on its own. What is interesting is how now, four albums in, we can track a kind of trajectory for the band since the trio reunited. Beyond melded the sheer muscle of the band's early work with the more overt pop sensibilities Dinosaur Jr. took on in the '90s. Farm soared with extended jams, pushing the guitar heroics and arena-rock size to their logical, and excellent, limits. I Bet on Sky added some sway and even funk to the band's sound. And now we've got Give a Glimpse of What Yer Not, which, ironically, makes something pretty clear about the band. That thing this album reminds us of? It's not guitars. Yes, Mascis delivers some unsurprisingly amazing solos on the record. Heck, the band even cobbled all of the solos together into one preview track available to stream online. "Goin' Down" opens the record with a towering turn by Mascis at the end of the song. He blows the "Good to Know" wide open in its second half. On "Be a Part", the solo broadens and deepens the bittersweet melancholy of the song. And here's where we get the reminder. Not in guitar solos, but in effect. While we often focus on all that is face-melting and shredding about Dinosaur Jr., Give a Glimpse of What Yer Not might be what you'd call the band's sad record, if it didn't remind you that all of Dinosaur Jr.'s records are steeped in a deep, often isolated pathos. But it's on display here more than we've seen from the other reunited records, and it makes the record resonate. The songs all run around four to five minutes, so the songs don't stretch out or truncate. Murph's tight, powerful drums, the deep hooks, and Barlow's steady, subtly complicated bass make the songs immediate. But what makes them last is the way these songs don't bury emotion under volume and huge riffs and big solos, but how the band uses one to expand upon the other. This is best heard in the late album run from "Lost All Day" to "Knocked Around" to "Mirror". "Lost All Day" almost twangs with a rolling opening hook, and then Mascis delivers a line that could not be more perfect for his emotion-cracked voice. "Oh baby, what went wrong with you and me?" he asks. He repeats the "you and me". Around him the music sounds as conflicted with exhaustion and nostalgia as he does. Murph and Barlow lay down a spacious rhythm, the kind the mind can wander within. And it might not work if we just got the downtrodden verses, but Mascis shifts into high register for the chorus, one final pleading yelp to know why. It's a song about wanting reasons, but also knowing that reasons won't help. "Knocked Around" slows down the dusty jangle of "Lost All Day" to a blue-light slow jam, with Mascis's high vocals leaning, heartbreakingly, on the line "and I miss you all the time." It's as devastating a song as Dinosaur Jr. has ever made, and yet they won't sit still. The second of the song erupts into the album's most thrilling moment. Murph rolls on the toms and the band shifts the song into another gear. Mascis's solo, more than ever, sounds like someone breaking free from all that heavy pain, or maybe it's just turning sadness into celebration, missing into paying tribute. "Mirror" splits the different between the two songs, driving moodily like "Lost All Day" but carving out the shadowy spaces we hear on the first half of "Knocked Around". Here, Mascis has been "crawling around since I met you," no longer missing but maybe not in a better place. All through the record, there's a sense of isolation, of being distanced from a certain someone, but the remarkable thing on this record is that something in the mix of these songs, something unspoken at their edges, suggests that it's not just about some romantic break. It's about the ways we have to confront ourselves when that other person, when that other thing we were focused on, leaves. This kind of self-consciousness works its way through all of Dinosaur Jr.'s work -- remember "Feel the Pain"? -- but Give A Glimpse Of What Yet Not comes at it straight on, and feels lasting as a result. Barlow and Mascis also feel more in synch than ever. Where Barlow was the experimental, edgy counterpoint on the early records, and the moody shift on songs like "Back to Your Heart" from Beyond, here Barlow's songs echo Mascis's. Both "Love Is" and "Left/Right" do change things up -- with the acoustic textures of the former and the loose rattle of the latter -- but when Barlow sings "My fate is my fate / I'll lie back and wait", it feels less like resignation and more like a guy who has also fought this isolation, this constant examination of the self. It's not so much that fate is inevitable, but that it is his own. This is a shift from a guy who once believed in fate because fate believed in him first. This much is clear: Give a Glimpse of What Yer Not is not just another Dinosaur Jr. record. In fact, at this point, the notion that there is a uniform thing we call a Dinosaur Jr. record -- at least for the Mascis/Murph/Barlow line-up -- seems too simple and seems to miss what's been so great about the band's reunion. The band keeps its aesthetic, but it keeps twisting it into new shapes. This shape might be the most personal one yet, and it's as impressive and lasting as anything the band has made.